I was seven years old the last time I attended a dinner theater performance. I still remember being wowed by the endless buffet of food and enthralled by the hummable tunes of “South Pacific.” Since then, I haven’t given much thought to the art of topping an ice cream sundae with Broadway glitz. 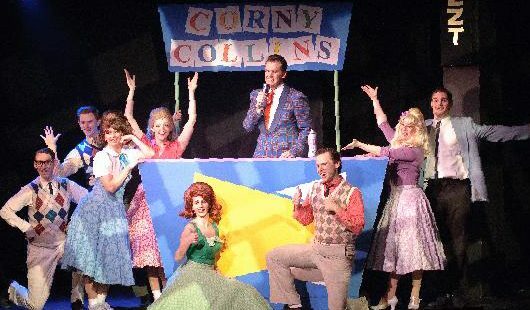 But Toby’s Dinner Theater does it quite well in its production of John Waters’ “Hairspray,” now playing at its Baltimore location through July 1. For those of you non-Baltimoreans, “Hairspray” is the cult movie and Broadway smash-hit by unconventional Baltimore film producer/director John Waters. It is the story of an overweight but cheery misfit teenager, Tracy Turnblad, who refuses to give in to the limitations anyone would place on her. Despite ridicule from thinner, more popular girls and a villainous TV producer, Tracy dances – and charms – her way onto the Corny Collins Show. Set in our very own backyard of Baltimore in the 1960s, “Hairspray” paints segregation in its ugliest terms, and Tracy fearlessly uses the only thing she knows as a way to unite the community and bring people together. She’s bold enough to dare to dream of snatching the hunk, too – fellow dancer Link Larkin – and manages to win his heart, as well, in the process. Celia Blitzer is a magical Tracy, capturing Tracy’s earnest and persistent idealism with unmistakable charisma. Many heavyset women would never be willing to endure the scorn Tracy faces, but her sweet naiveté earns her the reward of her labors and also makes a lasting change in her community. And Blitzer pulls it off brilliantly, with a powerhouse voice that can keep up with the strenuous vocal demands of the score. Austin Colby’s Link Larkin croons with such soulful intensity it makes you think he truly could be pursuing a solo recording career. And “Hairspray” is definitely a feel-good, razzle-dazzle show, but Lawrence B. Munsey still manages to steal the scene a few times with his comedic portrayal of Edna, Tracy’s mother. Munsey also directed the show. There a few missteps, however. Katie Heidbreder possesses a lovely voice, but falls flat in her dramatic portrayal of Amber von Tussle, the thin, blonde nemesis to Tracy. Elizabeth Rayca also comes off as a little stilted as Velma von Tussle, the evil TV producer and mother to Amber. The choreography works at times, but can be painfully distracting at others. Although some of the dance numbers capture the score’s inspiration, many are simple and uninspired – “I Can Hear the Bells,” for example. But these are minor flaws in an otherwise solid production of a hit show that has won over audiences throughout the country. “Hairspray” requires a large cast, and for the most part, they sing and dance your evening into a very good time. You also have the kitschy pleasure of being served your drinks by the actors, breaking the usual wall between performer and audience member. 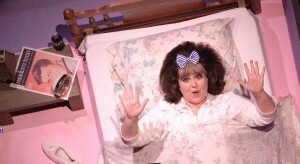 When Tracy first walks into the Corny Collins Show to audition, one of the girl’s says she’s either “blind or completely deranged.” That’s the beauty of “Hairspray,” really – Tracy Turnblad is just deranged enough to not realize her dreams may not come true. That simple, unwavering belief is why we love her. 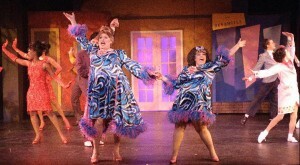 “Hairspray” is playing at Toby’s Dinner Theatre in Baltimore through July 1. Performances are Thursday-Sunday, with selected matinees. Reservations required. $41-$53. 410.649.1660.